Given the show’s premise I simply can’t watch it morally, but I don’t really need to watch it to know that while it is meant to be a fat-girl revenge story it just fails on many levels. For one, the entire cast is made up of thin women. Yes, even the former-fat protagonist that is meant to somehow bring about a message of female empowerment is a thin actress in a bodysuit. Then we have said protagonist essentially go through crash diet, as a result of having her mouth wired shut no less, in order to lose enough weight for her to gain a socially ideal body which she basically weaponizes to get her revenge. Honestly, who asked for this to be a thing? If this really was meant to be a satirical story where a plus size girl gets revenge, probably à la Carrie in tone, why couldn’t the protagonist just stay plus sized? Not only that, but why couldn’t the role go to a plus size actress? It would make for a much more interesting story for the character to unlearn societal beauty norms and embrace self love while revealing that the fatphobia she suffered through was actually done by closeted fat fetishists/lovers. It would also be a stronger image to show her winning the beauty pageant over her thinner competitors. And while I’m not going to really get into this now (because we’ll be here all day), the decision to go with an adjective like “insatiable” for a title makes it very clear that the team behind it was just beyond ignorant of how offensive this whole thing is. I mean its 2018, we should be better than this by now! 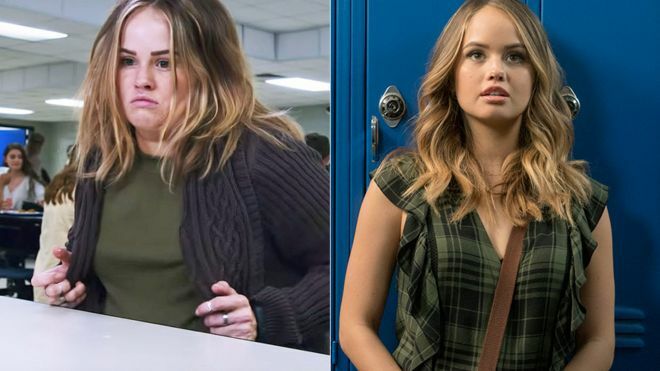 Interestingly enough, around the same time Insatiable got enough people to hate-watch it to be renewed for a second season, another series was released alongside of it that went about unnoticed with a narrative that could be argued to being one that attempts steps towards body positivity. The Japanese drama, Switched was adapted from a manga entitled, Sora wo Kakeru Yodaka, and being only 6 episodes long making it is a quick binge. The basic premise is that 16 year old Ayumi gets her body stolen by her plus sized classmate, Umine who covets Ayumi’s popularity, her beauty and her new boyfriend. Granted body-switching is not an original idea by any means and with one of the bodies in question being that of a thin, conventionally beautiful woman that makes it even less so. Yet what makes the narrative here interesting is its subtle commentary of the value society places on appearance with a dark supernatural twist. Unlike some of the body-switching tales of the past which use this as an accidental scenario for the benefit of comedy, this one has it the switch be done on purpose by an antagonist with malicious intent brought on by an incredibly negative self image. The reason why this series stands out as body positive to me is the act that Ayumi does not lament the fact that she is in a bigger body, or the lost of her “beauty status,” rather she is more upset that her life, family and boyfriend are taken from her. She doesn’t even start thinking negatively about her appearance until the minute her classmates pick on her for it and she begins to second guess if they were only friendly because of the way she looked and not because of who she is. This idea is only re-forced by Umine’s response to studying her body up close when she is confronted by Ayumi after the switch. It is an interaction that is both heartbreaking and relatable for anyone who has ever gone through a period of self hate. I grew up around some people that would not hang out with me because my “appearance embarrassed them” so I’m not going to lie, hearing that line made me tear up a bit. * The series also wins major points in its realistic portrayal of how the insecurities of a parent can transfer over to their child which in turn can distort their self image, and overall outlook on life. This is especially progressive for a series coming from Asia where thin body ideals are celebrated and considered the height of beauty. Even though the series takes great strides towards being a body positive narrative, it does have its weak points just like any other. For example, as you could expect with a series that has suicide via jumping off buildings as the trigger for body-switching, depictions of the act leave very little to the imagination. I should note that it doesn’t happen often and its not done just for kicks rather to highlight the sheer brutality involved in the act of switching. I’m not sure if Netflix realizes about the contradictions found in their streaming queues, yet with the recent release of the Dumplin’ trailer, I feel like they are slowly realizing their unique position in the entertainment industry that gives them the opportunity to present a different kind of narrative that can go against the offensive fatphoic mainstream. One that will hopefully encourage even the more established film makers and television networks to follow suit. *I should note that this is a sentiment that he later extends to Umine at the end of series. I also will say this, after everything that happens in this series Kaga definitely deserved so much better in the end. People have been talking about finding a guy like Peter Kavinsky meanwhile I’m over here looking for my Kaga. Have you watched either Insatiable or Switched on Netflix? What did you think about the kinds of narratives they decided to present? I tried my hand at watching Insatiable before the hype and it was a total flop for me. Of all of the directions that this show could have went, I’m still perplexed why the main character had to be in a thinner body to get revenge. But what do I know, I just write content for women of color. I also watched Switched and appreciated the dissected commentary on self esteem, suicide, and bullying culture in Japan. There was so much going on in Switched that I had to watch it a second time.